With regard to Franklin's Gulls, back in October of 2010, I wrote, "Tracking weather systems for this species is for the most part reliable and predictable. The ideal parameters involve areas of low barometric pressure with a strong west to northwest wind with the passage of a cold front". I called these systems, "Franklin's Fronts". Those conditions setup perfectly late Sunday night, and by sunrise, reports of this species were pouring in from the southwest Great Lakes region. 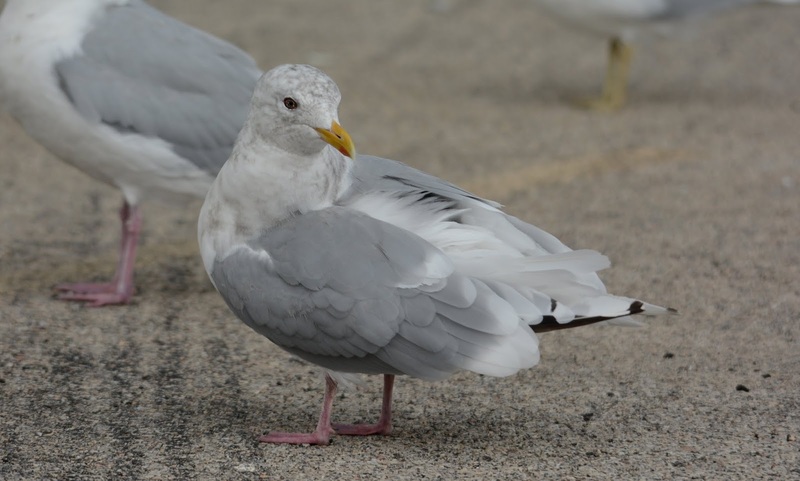 The Chicago lakefront saw close to 100 birds on the Lake Michigan shoreline - that's a great count for Northern Illinois. I found 5 birds inland, in a parking lot in Lake County, Illinois. Oddly, this same parking lot is where I go to search for winter gulls - Thayer's and such - but not hooded species. I did find 4 adult-type Thayer's (for a total of 8 so far this month!) and 2 Lesser Black-backeds (adult & juvenile). All of the photos below were taken in Lake County, Illinois on 12 October 2015. Two of my favorite species - Franklin's & Lesser Black-backed - all hatch year birds! Bird #1. Most of the upperparts are fresh - a common molt state when THGU arrive here. Left eye slightly paler than right eye. Bird #2. A skittish THGU. This primary molt stage is closer to typical for our arriving THGU. This may be the first time I've captured a Thayer's (left) and a Franklin's in the same frame. First cycle Herring & Lesser. Adult type Herring with retained P10. Note how the "white" mirrors have deteriorated more than the "black" regions of the feathers. White pigment is not as durable as black. Hatch year Ring-billed. For a moment, I thought I had an individual with advanced leg color, but it appears to be an external colorant.